Discussion in 'Citizens' started by Jun Kurosu, Nov 7, 2018. Jun is very intelligent and well learned, having exposure to cultures -- especially French books and flower language -- beyond his native Japan, along with being a whiz at math and science. He also has an array of knowledge about the occult and astrology -- especially tarot -- from his father, and fashion from his mother. Along with that, Jun is an adept battler, having fought alongside his friends for the sake of the universe and held his own as a member of the party. His weapon choice is… unorthodox, not many people battle with weaponized flowers, but he's proven that despite the odd choice, it's no less powerful. Special AbilitiesJun is a Classical, or Old Generation Persona User. As such, his abilities work a little different than New Generation Users. His True Arcana is the Wheel of Fortune, though he's also capable of wielding Personas from the Magician, Hanged Man, and World Major Arcana, and any Persona who's max level mutation assigns it the Suit of Wands or the Suit of Cups upon completion. Older Personas are capable of powerful attacks when they team up with another User's Persona. Chronos is no different. Should any viable party member be in Pandora, the two can attack together for a Fusion Spell to deal massive amounts of damage. He currently only has access to his True Persona, Chronos. NPC's AbilitiesChronos is Jun's True Persona -- Similar to an Ultimate Persona for Newer Users -- and gives him access to several powerful abilities. In addition to that, when Chronos is active, any damaging source of wind, light, or darkness takes no effect, any magical attempt to put him to sleep, to charm, or to scare him is reflected back on the caster. Ice, electricity, and nuclear damages are weakened, but any assault made with earth, such as a rock, dirt, or sand, deals extra damage. Garudyne - Chronos causes a localized, five to ten ft diameter twister to descend on the enemy, dealing a large amount of wind damage. The strength is enough to lift light things such as cardboard or wicker, or small but heavy items such as a picture frame. This drains a fair amount of Jun's energy. Magarudyne - Same as Garudyne, but for up to five enemies, each with their own twister. This drains much more of his energy. Cross Fortune - a powerful attack of biting wind and blinding light that hits all enemies on the field. Drains a massive amount of Jun's energy. Samarecarm - A full heal, and a removal of any battle-dangerous ailments, such as sleeping, being charmed, or being poisoned for one person. Drains a fair amount of energy. EquipmentJun enters Pandora with his flower weapons -- essentially darts. Definitely ranged -- his 1992-era cell phone, and a mysterious keepsake watch that he refuses to part with under any circumstances. Flowers are not an incredibly threatening weapon, and Jun himself is not incredibly physically threatening either, so defending himself all on his own might be a little tricky. Normally, Jun would be able to make full use of Persona both in and out of a cognitive world, however Pandora has attempted to mediate the great discrepancy between the Generations by making the Older align with the Newer. 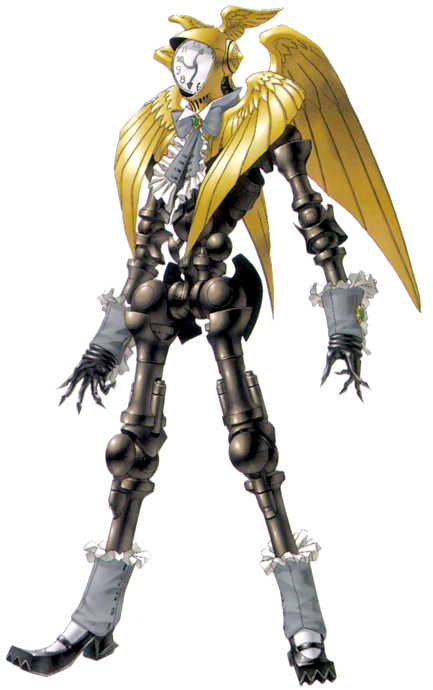 Thus Jun may only activate and summon his Persona within a cognitive world as a Newer User would need to, so no strengths or weaknesses apply in Pandora's overworld. Also, Physical Persona skills now drain his life-force instead of energy, instead of both being energy drains. He'll need to get used to the former. Jun is fairly introverted to the point of obviously anti-social, and as a result may come off a little cold or aloof to strangers. However he's incredibly warm and loving to those he considers friends, and even jokes around with them, much more at ease with himself and his actions. He also has a strong sense of justice, and a determined drive to see things through. However, being Joker, causing suffering, and watching a good friend die has impacted him greatly. He's much jumpier, and may keep to himself more often, even around friends. His self-worth has also tanked significantly, and he's still dealing with wisps of false memories from Nyarlathotep's influence. He doesn't believe himself worthy of several things he wants because of what he did under this influence, like the love or acceptance of friends. Jun and Tatsuya first met as young children, Jun wanting to escape his neglectful mother and the fights between her and his father. He and Tatsuya clicked immediately and exchanged small, secret treasures to keep a part of their best friend with them. Tatsuya gave Jun a watch from his father, and Jun gave Tatsuya his favorite lighter. The two formed a small group of friends with two other children, Eikichi Mishina and Lisa Silverman, that they met while playing as Neo Featherman Rangers. Maya Amano joined them later as a big sisterly figure and the five had a lot of fun together. Tatsuya and Jun were always the closest though, the shadow to the other's light, so to speak. Perhaps because of this, Jun developed a bit of a puppy crush on Tatsuya, that simply spiraled into a full on enamoration. However, Jun's home life began to get worse and worse, he began to openly hate his mother and denounce his father, which was only made worse when his father died. Maya admitted she was moving away one day, and in a fit of upset, Lisa and Eikichi locked her in the shrine to keep her with them, with Tatsuya and Jun neutral, though Tatsuya was locked into the shrine as well. An arsonist set the shrine on fire and burned it almost to the ground. Lisa, and Eikichi, believing they had killed Maya and Tatsuya, abandoned their little friend group in horror and repressed their memories of the event. The sheer terror left Maya and Tatsuya with mental scars of their own that they repressed as well. This left Jun completely alone. Without the group to be with him, Jun's mental state worsened. His father had been replaced by an idealistic replica when he'd died, formed by Nyarlathotep, and the replica began to twist Jun's childhood memories until he firmly believed his previous friends had been out to kill Maya from the start. Enraged by their lack of remorse, he became a monstrous wish-granter by the name of Joker, and unknowingly began to fulfill a world-ending prophecy in his quest for revenge. Eventually he directly confronted the reunited playgroup -- who by now had all remembered the true past. -- and they quite literally beat the sense into him. Nyarlathotep, disgusted by Jun's recovery, left him to die. Tatsuya's group quickly pulled him into their ranks and they set about attempting to save the ending world. However with Maya's death in the subconscious, the prophecy was fulfilled and the end came. The group watched in horror as the world ended, and in that stunned moment of grief was when Pandora stole Jun away. He felt the thud more than heard it, but really, it didn't matter what he'd hit with his shoulder, even the pain spiking through his arm genuinely wasn't enough to pull him out of the stunned grief in his head. Maya. Maya Amano was dead. The world was ending. They'd failed, they'd failed, all that work and they'd failed and it was all his fault-! God, he couldn't imagine what they must think of him now, crying here like he had the right to be upset. He didn't want to open his eyes, not even when he felt a hand brush his shoulder. He did flinch, though, and the hand retracted quickly. His eyes snapped open, because that wasn't a voice he knew - that wasn't a face he knew, and Jun quickly realized, with some sort of confused panic, that he absolutely was no longer in the subconscious. The city around him was vastly new, the blaring of cars and the shining of reflective windows assaulting his already overwhelmed brain. “Pandora.” The stranger informed gently. “P-Pandora..?” Where on Earth was..? Pandora… this wasn't Japan, or Xibalba… or... anything he knew. It couldn't be. The sky wasn't broken and blasted and the buildings stood tall. Somehow that was a whole lot scarier. Did he even deserve a second chance, after all he'd done..? The stranger was waiting. Jun took a slow breath, wiped at his eyes, and followed. Jun looks great! He's all set, go do the thing!